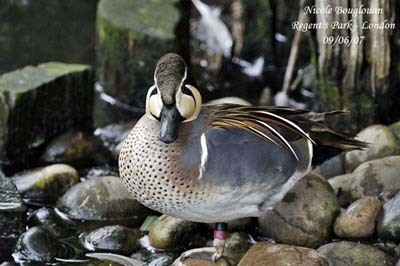 Baikal Teal adult male has dark grey bill, brown eyes, grey or yellowish-grey legs and dusky webbed feet. Head and neck are conspicuously coloured with cream, black and green. Crown, nape and throat are black. We can see a white line from the eye to the throat, separating the pale buff face from the metallic green crescent which extends to the rear eye and down to the neck sides. Another white line separates the black crown from the green crescent, and joins the nape to the throat. The breast is pale pinkish-brown spotted black, turning grey to body sides and grey flanks. There is a vertical white line on each side of the breast, and another line separates the flanks from the black undertail coverts. Belly is white. Tail is brown with pale outer rectrices. Undertail coverts are black. Upperparts are brownish, with cinnamon, cream and black scapulars and elongated tertials. On the dark grey-brown wings, the great coverts are spotted cinnamon, secondary feathers are glossy green-black with white tips. In basic plumage, male is similar to female, with duller facial pattern than in breeding plumage. This species is really endangered. Habitat loss due to agriculture extension and human developments, hunting, collisions with any kind of wires, disturbances by fishermen and poachers, are important causes that involve great declines of the species. In China and South Korea, these birds are killed by poisoning. Protection measures are considered, with protection of sites and hunting management. However, the captive population is well established and stable. 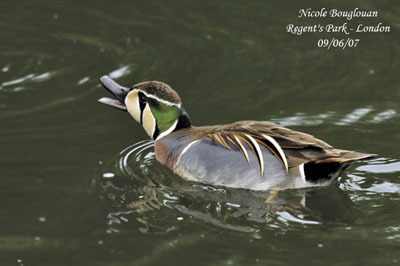 Baikal Teal adult female has dark brown crown and nape. Face is buff speckled darker. We can see a rounded white patch at bill base. Chin and throat are white, with a white stripe from the throat to the eye. A black line runs from the eye to the nape showing a reddish streak. The upperparts are dark brown, as breast and flanks, with darker central feathers. Belly and undertail coverts are white. Wings are similar to those of the male. Juvenile has dark grey bill, brown eyes, grey or yellowish-grey legs and darker webbed feet. It is similar to female but duller, and lacks the white patch at bill base. Underparts are brown, spotted and streaked. Chicks have dark brown upperparts with yellow markings. Underparts and face are yellow. The eyeline is black. Bill and legs are grey. Baikal Teal male utters non-stop contact call when in flocks, on water or flying, mainly in spring. This call is a deep chattering “wot-wot-wot”. 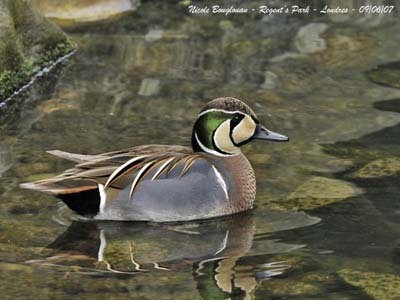 Baikal teal frequents pools, marshes, small lakes and rivers, in wooded areas and tundra. During winter, it frequents shallow freshwater areas, swamps and sheltered coasts. 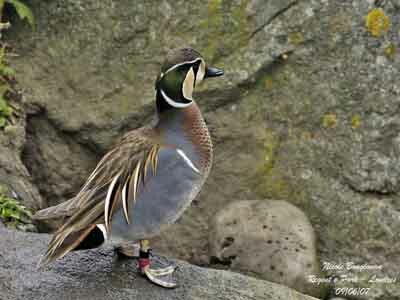 Baikal Teal is found in N and C Siberia, south of Baikal Lake and Okhotsk Sea. During winter, it migrates to India, Burma and E China, S Japan, West Indies and the Bahamas. It feeds by dabbling at the water surface, and plunging the head under water with elongated body at surface. It also feeds on the ground, taking seeds in the fields during winter. It dabbles by day and feeds in the fields by night. 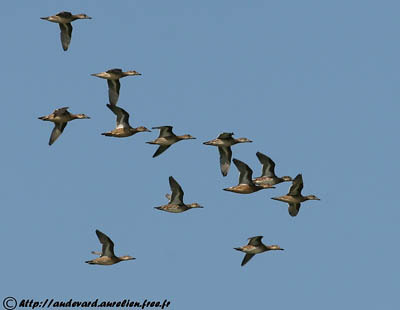 Baikal Teal is very gregarious, forming large flocks in winter. The males moult close to the breeding areas. They are sometimes mixed with other species. 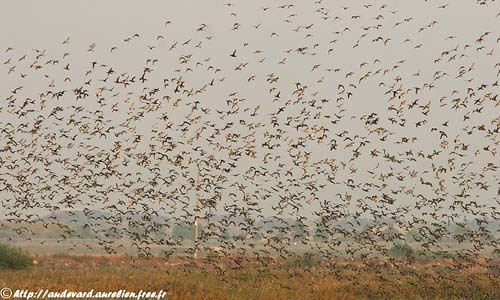 Pairs form on wintering areas. Male abandons female when the chicks hatch. Baikal Teals’ flocks approaching the feeding areas are noisy, as a storm. These flocks are huge. The teals whirl into the sky in acrobatic formations. There are hundreds of teals, but not a bird leaves the formation. They create conspicuous shapes in the sky. The most beautiful is the colour of these flocks. As they always change their direction, the sun plays with the feathers, involving shining reflection. Such flights may be compared to a dance. Breeding season starts in May. 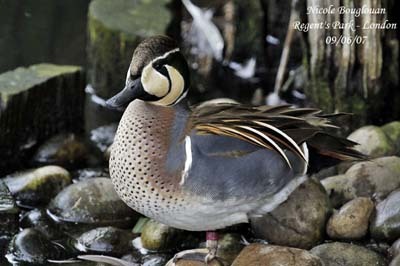 Baikal Teal is solitary nester or sometimes, it may nest in small groups. The nest is built by female and situated near water, but in dry place. It is made with vegetation, grasses, pieces of plants and willow. Female lays 6-9 pale green eggs. Incubation lasts about 24-25 days, by female alone. Hatching is synchronized. Chicks are completely feathered about 45-55 days after hatching. They reach their sexual maturity at one year. 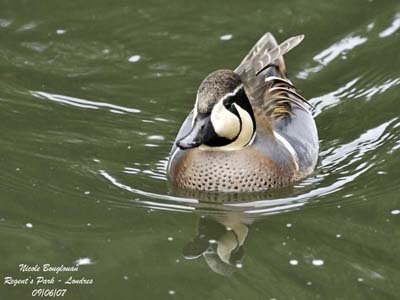 Baikal Teal feeds on seeds, leaves and grass weeds, sedges, aquatic vegetation, seeds coming from crops such as rice and soya, and acorns. It also consumes small aquatic invertebrates, snails and insects.